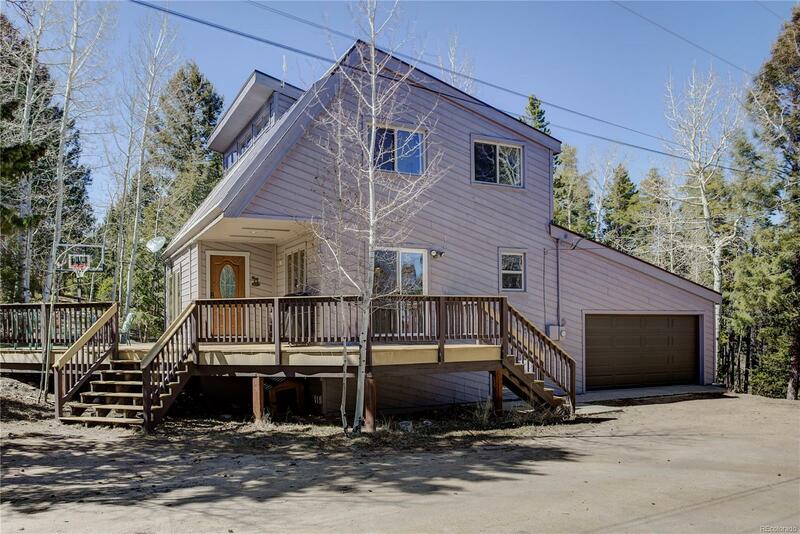 This terrific home in Conifer sits in a wonderful neighborhood on Shadow Mountain, just 10 minutes to local amenities, schools, and HWY 285 for downtown, or DTC commute. You will love the versatility of the flatter, private, 2 acres with ample parking, plus a 2 car heated garage. Enter into this sun-drenched home to be greeted by the grand family room with wood burning stove, and walls of windows. This leads to a updated powder room and eat-in kitchen nook with sliding doors providing access to the wrap around deck and patio. The spacious kitchen offers a wonderful walk-in pantry with ample storage space. Upstairs you will find 2 bedrooms and updated full bath, and Master suite with walk-in closet and beautifully remodeled bath. This home provides the perfect floorpan with room to grow, as you finish off the basement to fit your personal needs. This home is truly move-in ready-Welcome home!